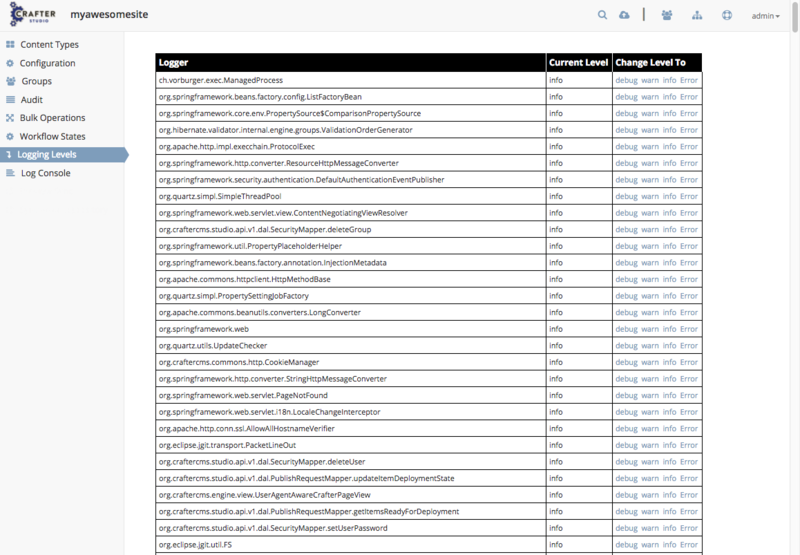 Various log files are created when running Crafter CMS. This section details the logs available for viewing through Crafter Studio. Crafter CMS tracks the date, time, user and action performed to content through an audit log. Crafter CMS has a Log Console that allows you to view messages depending on what what log levels and what Java packages you’d like to track. To view logs in Crafter Studio, click on from the Sidebar, then click on Log Console. Before we look inside the Log Console, we need to setup what messages we want to display. The messages displayed in the Log Console depends on what levels are set for the Java packages being run in Crafter CMS. To see the loggers available for setting log levels to, click on then Logging Levels. Find the Java package you would like to view the logs of and set the desired log level. The lower your logging levels are set, the more verbose your logs will be.